That’s the second all-nighter Ananda has pulled in three days. But to anyone familiar with the lifestyle of a musician, perpetual writer's block and late-night (rather, all-night) recording sessions are nothing out of the ordinary. Then again, these all-nighters aren’t a one (two or three) time deal. In June 2007, Ananda pledged to write, record, produce, and post one free mp3 song on his website, every week, for 52 weeks straight. The first week of September marks the beginning of just week ten, and the enormity of Ananda’s undertaking is clear. “Everybody” doesn’t just refer to friends and family; it includes a wealth of well-respected professionals, artists, record producers, entertainers, and entrepreneurs. Though Ananda may be an unknown to most music listeners, he’s no stranger to the music industry. Ananda dazzled audiences at talent shows and school choir performances. While honing his fondness for classic rock music, he became the lead singer of a few bands in high school, a transition his parents weren’t particularly “thrilled" about. But Ananda eventually gave up rock bands and headed to the University of Pennsylvania, where his vocal training and knack for musical arrangement made him an essential asset to campus a capella groups. Penn Masala, the world's first Hindi a capella group, was born that year,with Ananda serving as the founding Music Director. Together, the founding members established the framework for what would evolve into one of the most popular musical groups within the South Asian Diaspora. It’s easy to detect Ananda’s modesty, as he bashfully grazes over the professional and academic achievements most people would boast about: a B.A. from the University of Pennsylvania, a JD from Stanford University, and jobs in radio promotion and law with major as well as independent record companies (Capitol, Hollywood, and Century Media). Ananda had even started his own record company with his former Capitol Records boss, putting out two albums, before eventually calling it quits. On paper, Ananda has achieved all the professional goals he has pursued, but on the inside, something has always felt missing. “I was pursuing all of these careers that side-stepped what I really wanted to do,” he reflects. It was shortly after this realization that Ananda decided to quit his job as general counsel at an independent record label to pursue music full time. Though originally a vocalist, Ananda has evolved into a multi-faceted, multi-talented musician whose reach ranges from playing a handful of instruments (“tabla, keyboard, guitar, whatever I could get my hands on”), to writing and producing all his own music (“I spend all of my disposable income on recording equipment"), to learning all of the necessary engineering and technology (“I sat for literally six hours last Sunday reading music software manuals"). Citing musical influences like Sting and Led Zeppelin, Ananda’s music is an eclectic blend of worldly influences, combining beats and rhythms from various regions of the world with his soulful, soothing voice. 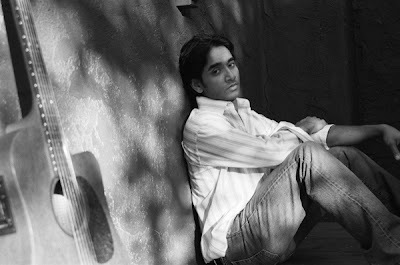 Some songs are slow and emotional ballads, like “Live Forever.” Others songs have a more reggae feel, like Week Three’s “Haunting You,” or even a Latin flair like Week One’s “Overthrown.” In “Set Me Free” (off Ananda’s debut EP), Ananda melds the influences of East and West by using hypnotic bhangra beats to compliment a fast-paced, upbeat melody. And yet while Ananda’s music is versatile enough to jump from one genre to the next, his songwriting and voice stay consistent and complementary to one another (even when he sings a few lines, impromptu style, during the interview). His lyrics are comprised of versatile, deeply insightful verses, and complex rhyme schemes. But above all else, when Ananda sings, his sound is so natural and soul-felt that you can’t help but wonder how he ever considered pursuing any other profession. And by spectacular, Ananda isn’t referring to all of the glitz and glam that most star-studded musicians dream about; he’s talking about his commitment to write and record one song a week for one entire year-a completely innovative approach to making music these days. “This project doesn’t really make any sense because I’m not making any money off of it,” he explains from a very practical standpoint. His motives are simple and straightforward. Ananda wants to establish a connection with listeners and doesn’t believe that the traditional route of putting a CD out every two years can do so. “It’s boring to have a website that says, ‘come back next week for a new tour date or screensaver to download.’ A website should have something new for the listener every week, like a television show,” outlines Ananda. Inadvertently, Ananda’s music venture reflects ”the real-time phenomena” of today: from blogs to instant messaging, reality television to webcams. Now you can add weekly music downloads to that list. While most artists rewrite and rehearse until they have recorded a perfect song, Ananda only has seven days. “A week is just about enough time to write and record a “studio-quality” song,” says Ananda. “I haven’t pre-recorded any songs, so I don’t have any buffer, and each week I’m putting together the song for that week itself."